For every 100 Secret Shopping Bags we sell, we will train a Maker Group in India to make and sell them to their local shop keepers. Hello, my name is Fritha. Thank you for watching my crowdfunding video. Below are the full details of the Secret Shopping Project. I run Secret Projects, a social business empowering women in India through the making and selling of foldable, useful, purposeful and charming products. I launched our lead products, Secret Pillow and Secret Sari Dress through reward based crowdfunding campaigns. I am excited to attempt the same again with Secret Shopping Bag. So let me back up and set the scene for you...In 2017 India banned disposaable plastics. It created a huge opportunity for the women living in India who stitch and who are trying to run their own micro enterprises. We work with 13 Maker Groups in 5 states in India. What these Makers ulitmately want is to earn a better income to support their families and educate their children. I am so often told that by our Makers that they want their children to have better opportunities in life than they did. I set up Secret Projects after I heard a shocking statistics in a Save the Children report in 2011, "80% of the worlds children living in childrens institutions are not there because they don't have any parents they are there because their parents can't afford to feed clothe and educate them." I am wanted to help mothers to look after their children, a basic human right. The dreams of our Makers is my primary motivation for ensuring that Secret Projects thrives. I started going to India regularly 10 years ago. I quickly learnt about the impressive schemes run by charities and the government to train women to stitch. They could stitch all sorts of products, they were carefully organised into self help groups (SHGs), they had been trained to book keep, they had access to government loans schemes and then came along the banks offering similar schemes. But so often when I asked "what are the women making and selling?' the answer came back, "nothing". "Nothing!" I became to determined to find out why. I learnt that it the selling of the products that was the most difficult piece of the process. Because the Makers had no confidence in being able to sell what they made they were reluctant to take the loans being offered to them. I can honestly say that I have never felt so gutted about something in all my life. Millions of women in India are just so close to leading a life where they can generate their own income and being confident enough to make their own choices for themselves and their children but they can't because nobody can work out how to sell. I vowed to make it my lifes work to find a solution to this selling problem. I knew it would not be easy but surely in this day an age of digital media, social media, ecommerce and global fulfilment, there has never been a better time to crack this selling challenge. I started off by making and selling products on the international market to ensure we could pay the Maker's double minimum wage per hour and provide them life long membership to our Training for Empowerment Programme. Receiving double minimum wage means that they could earn enough to firstly deal with their families most pressing financial issues and then go on to purchasing their own sewing machine or motorising the one they already had. During this process myself and our incredible team team in India developed a 4 stage empowerment programme called Training for Empowerment. The stages are training, professionalism, development and sales. I was always very clear to our Makers that they could not rely on our constant orders for export products and at some stage we would support them to sell their production services locally and/or product they had made. 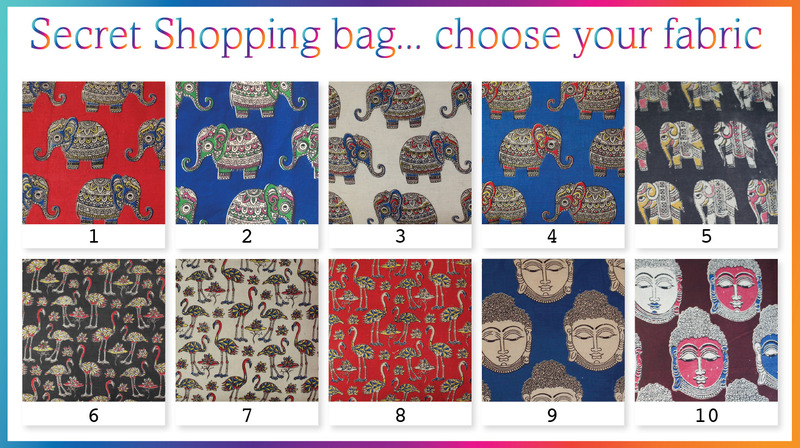 Secret Shopping Bag will enable us to move on truely offering stage 3 and 4 - development and sales. 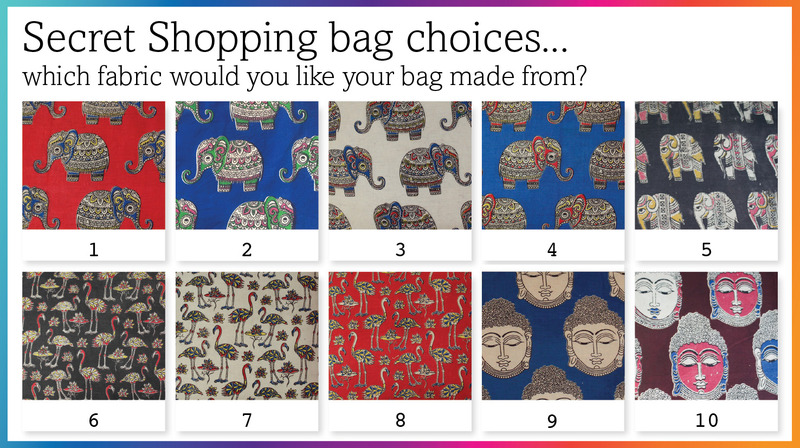 A huge thank you to my godmother, Lesley Pearce from New Zealand, who flew to India last November with the finalised shopping bag design and trained some of our Makers how to make them. Eureka moment by our Makers! It was at the end of that training course that the conversation began. The Makers started telling Lesley and I how plastic was banned and how increasingly local shop keepers were looking for stitchers to make shopping bags. We explored further asking if the Makers could produce the bags cheap enough for 1) them to be paid enough 2) to be sold at a price right for the shop keeper. The discussion continued and Lissy, our super quality controller, joined in. She explained she could help the Makers buy fabric by the kilo which would help keep the price of bag low enough. As I listeneed to their chatter, a crowdfunding campaign formed in my mind. If I could get 100 orders from our international customers for Secret Shopping Bags, I could train 1 Maker group to make them. I could pay them 70 rupees per bag. They reckoned as they learnt to make them they could knock out at 2 out per hour. By making the first 100 they would get faster. So once they had made the first 100 for the international customers they could source some fabric by the weight and make them for 20 rps per bag for stitching + material costs, meaning they could sell the bags to the shop keepers for 30 rps. The shop keepers, they reckoned, would sell them for 100 rps. The maths works! However, the Makers looked nervous because they don't know how to approach the shop keepers but I said that I would run a further training session on sales marketing and support each group to make their first sale. They seemed happy with that and we all agreed we should crowdfund again. So are you interested in buying a Secret Shopping bag for £15? This is includes your bag made in 100% cotton fabric of your choice, shipped to your door where ever you live in the world (!) and a contribution to the training of how to make the bag and the sales marketing training of how to sell the bag locally. Product break down for 1 shopping bag. The surplus that would help pay for the monthly running costs of Secret Projects - we are a not for profit organisation. Any quesitons, please email orders@secretprojects.org or call me on Whatsapp +447824999675, I am totally and utterly focused on this crowdfunding campaign. 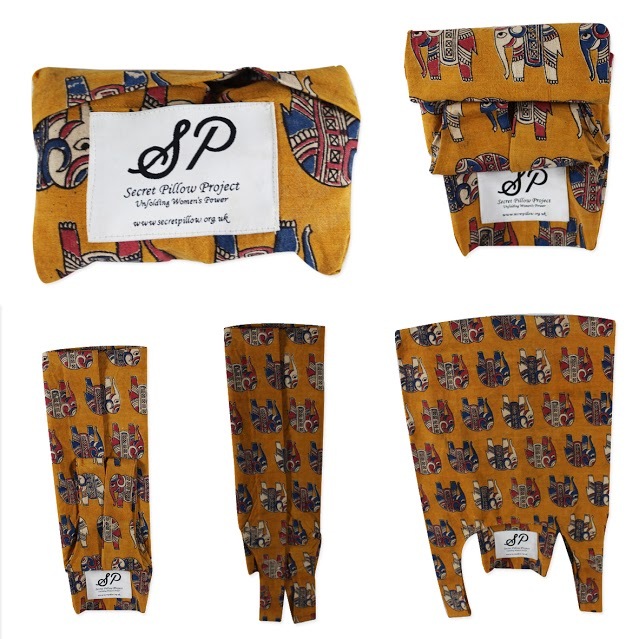 Secret Shopping bag made in fabric of your choice with international shipping and contribution to the Training for Empowerment Programme.